In 2011, a young artist, Ignatius Sampa created ripples on the Zambian art scene when he daringly introduced the public to radical images of characters from the Makishi masquerades and Mukanda initiation rites in caricatured portrayals and renderings of not only everyday life but of famous paintings by Leonardo Da Vinci like it had never seen before. In fact, his Makishi Last Supper (after Leonardo Da Vinci) was bought by the Lechwe Art Trust, making him the youngest artist to have work included in the prestigious collection of Zambian art overseen by Cynthia Zukas at the age of 20. 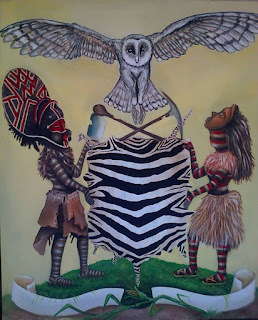 A time honoured, sacred custom the initiations rites of the top-secret Mukanda society and its masked characters are revered by the Luvale, Chokwe, Luchazi and Mbunda people of North Western and Western provinces of Zambia as custodians of male initiation. But about a year after his witty entrance onto the scene, Sampa vanished, casting aside his brushes and canvases falling completely off the visual arts radar. The rumours that he had quit art for good and either taken to the bottle or opened his own liquor retail business at the height of the infamous Tujili jili (bootleg spirit sachets) period were tossed here and there, and the young rogue artist was hard to trace having switched several mobile phone numbers. Last year, however, Sampa bounced back reappearing at the Art Academy Without Walls (AAWW) in the Lusaka Showgrounds where he had previously made friends. He set up studio space and started to work once again, all the more with a somewhat renewed enthusiasm. But again he became inconsistent sometimes disappearing for a week or longer as he had now landed a job as the resident graphic designer at the Food Lover’s Market in Levy Junction Mall. Even amidst these brash disappearing maneuvers, the artist remained busy in the background. Sampa now has a huge body of work that could easily be ready for a solo exhibition, but he is in no hurry to show it. 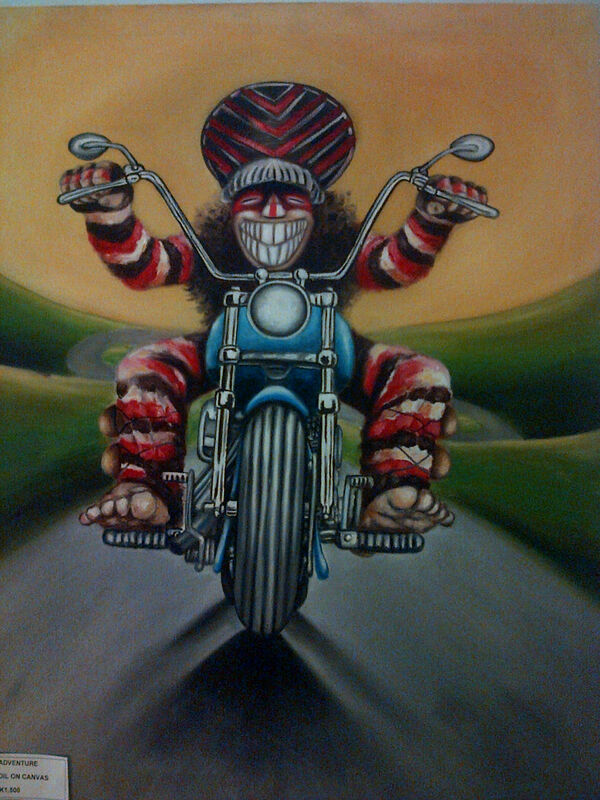 “Now I’m just painting because art is what I love doing. I’m not painting to sell at all, maybe later but not know, yes I will put a work in an exhibition now and then but I’m not really thirsty to sell. Sometimes people will offer me money for a work but I won’t sell it because I want to be looking at it myself”, he recently said with a slight air of narcissism. Surely if you visit the one room space he has converted into living quarters in the Lusaka Showgrounds, just behind Riflemen -- the army run civilian’s pub -- you will find stacks of fascinating Makishi themed paintings regrettably hidden from public view and enjoyment. 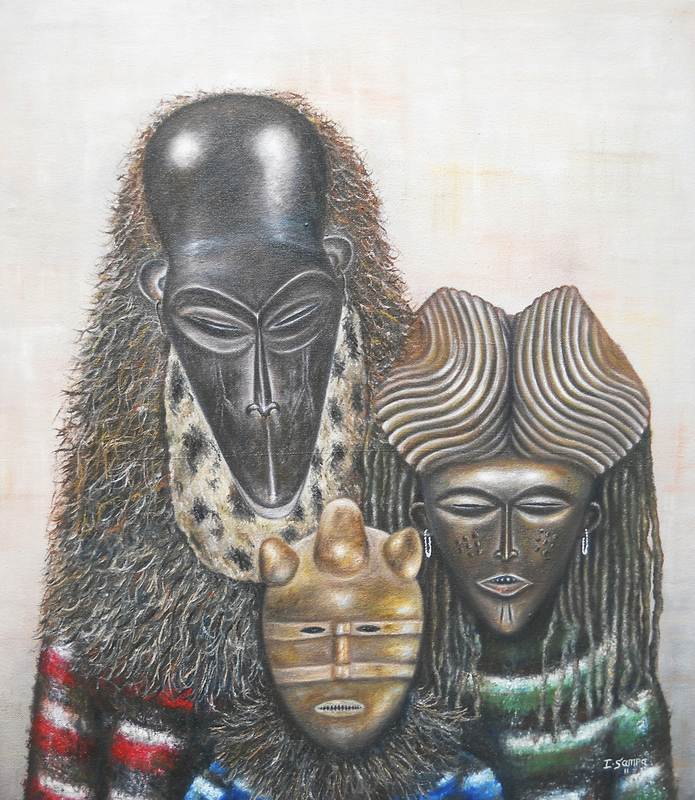 It is here you will find paintings such as Mwana Pwo, one of the most celebrated among the masked characters that represent the “ideal young woman” or “purest maiden”. 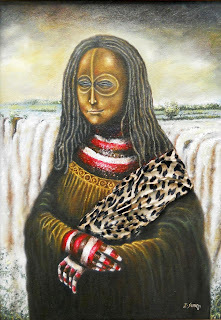 Sampa portrays Mwana Pwo as the Mona Lisa. But the similarities between Sampa’s and Leonardo’s depiction of Lisa Del Giaconda ends at the posture, enigmatic smile and partially, the outer garment. He does not mimic the eerie background of the Italian master that depicts some imaginary landscape with glacial mountains, winding paths, and a bridge. In his version, the background undoubtedly shows the Mosi-Oa- Tunya (Victoria Falls) and a few shrubs. Most likely, the artist was trying to further “Zambianize” the portrait by giving it this backdrop. By many western schools of artistic thought, the Mona Lisa is considered Da Vinci’s greatest work and a symbol of picture-perfect beauty, likewise, Mwana Pwo in the Makishi culture represents the ideal maiden and Sampa appears to be toying with this concept. Another clever painting is Culture and Religion. It shows the Pope in a brotherly embrace with a Likishi, with one arm across the shoulder of the other, they face their backs towards the viewer while waving at a multitude from a balcony. As the title and the picture suggests, Sampa is proposing that “foreign” religion and “local” traditions should work hand in hand, one beside the other. In Dinner, he portrays a Likishi couple at a table having a western style candlelight dinner complete with a bottle of red wine and tall stemmed wine glasses. The candlelight bounces off the wall of the traditional mud hut in which the couple is dining providing a dramatic visual effect of stark contrast between the dark and light areas of the painting. Exchanging Culture is a wedding scene. 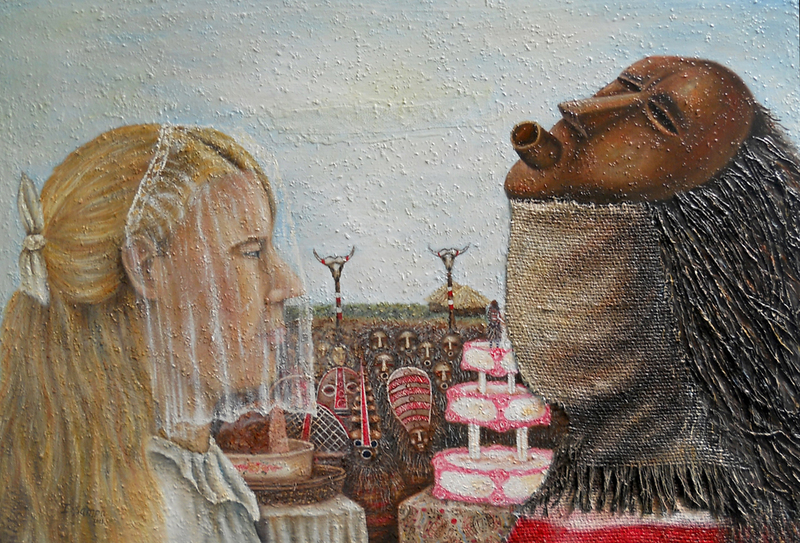 The blond, blue-eyed bride of European extraction is veiled in a frilly white wedding dress as per western tradition – or indeed the surrogate custom borrowed in present day Africa -- and the groom is the kind who’s mask faces the sky. The couple is being wed before a large crowd of Makishi and before the crowd is a large three tier wedding cake on the groom’s side while on the bride's side there appears to be a large batch of the Zambian polony-like vegetarian delicacy Chikanda . This the clever and often quirky way that Sampa plays around with clashing cultures and dissimilar traditions, and as far as never being short of surprises goes, he does not disappoint. Sampa’s choice of concept has not always sat well with everyone though. He once alluded to being harassed by artists whose traditional homeland is North Western province and regarded him as an outsider who has no right to dabble in the Luvale, Chokwe, Luchazi and Mbunda people’s sacred customs himself being a Northerner. Sampa confesses that this intimidation is what partially led to him quitting the scene for a while, but then he remembered that he has the entire artistic license and every right as the next man to refer to use Makishi culture as reference material to inform his artwork. 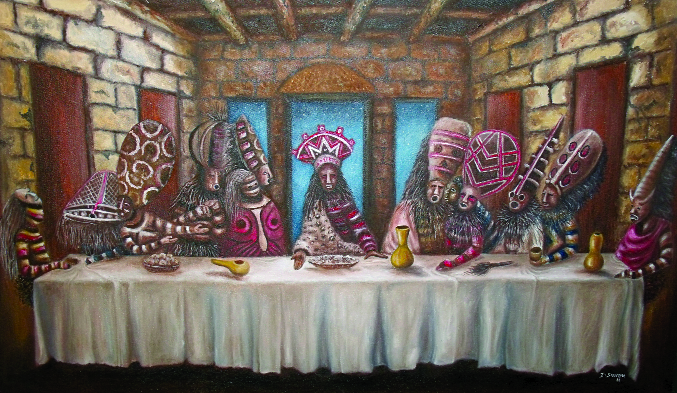 His ethos can be summed up in what he once said of his Makishi Last Supper, "All the last supper paintings I've seen have 'white' people in them, so I thought I should make one that is more African, in fact, more Zambian, and for me there is nothing that represents Zambia more strongly than the Makishi". The paintings mentioned here are just a handful of what he currently has in stock both at home and at the cubicle he used to occupy at the Art Academy Without Walls AAWW, so if his type of work tickles your fancy and you can find him in the right mood, he just might be able to let go of some of these fascinating paintings for a reasonable price while he still ponders what next to do with them. Apart from a residency at the AAW in 2010 when he joined the Visual Arts Council of Zambia (VAC) and the August Studio workshops for up-coming artists held in the Lusaka show grounds Sampa has had no formal training in art. 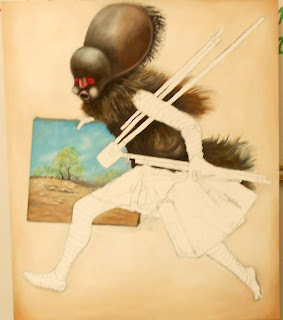 He first started experimenting with art when he observed his brothers and sisters working on their art projects for final secondary school examinations at their home in Chunga and during his early teens he received some guidance from Dominic Yombwe. He looks up to another young painter, Caleb Chisha, who showed him the ropes when he just joined the AAW but he says his use of colours is inspired by the palette of Lawrence Yombwe of Wayi Wayi Art Studio and Gallery in Livingstone. When most 17-year-old urban youths are not in school, they spend their recreational time ‘hanging out’ at shopping malls, watching movies, playing video games, fidgeting with their mobile phones or – whether we like it or not – indulging in alcohol abuse among other vice propelled activities. But Roy Jethro Phiri, a grade 12 pupil at St. Raphael’s Secondary School in Livingstone, a young man who declares he has had his share of teenage mischief, spends long hours creating miniature sculptures you would expect to see on the set of a Hollywood science fiction movie. 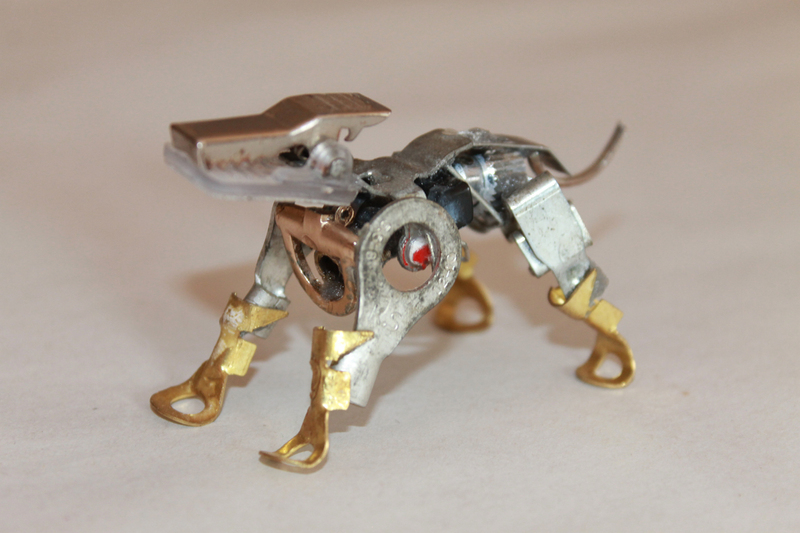 Using all types of miniscule, discarded material such as old cuff links, radio knobs and lighter switches, he creates convincing robotic dogs and police officers, and although they are inanimate, they give you the feeling that they might get up and start moving. “When I was young”, which ironically was only last year “I wanted to make a ring from my mother’s old glasses. But I ended up making a necklace instead. 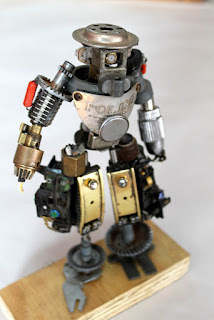 So sometimes I will start with one idea and end up making something else”, he says as he adds the last bit of adhesive to the breastplate of a robotic policeman. The breastplate is a former label from the protective casing of a ‘Police’ brand of sunglasses. “But the way it all started, is that I see shapes in the smallest things and then I think what if I stick this and that together what will I be able to create”, he says “I just throw pieces on the floor or on a table then I go to work”. 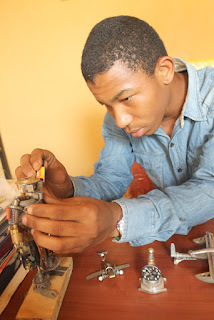 Phiri believes God blessed him with a photographic memory which he says has been quite helpful when he is creating miniatures. Apart from robots, he is also a submarine, aviation, car and motorcycle enthusiast who is confident that he will someday design all of these things if he gets the proper motivation and education. “I have pictures of motorbikes in my head, so when I saw the top of a used cigarette lighter I knew that this will be ideal for my motorbike’s fuel tank,” he says gesturing to a ‘chopper’ that he created as he went on to explain that the chopper which has a long front end with extended forks is often mistaken for a Harley Davidson. After he gave the author a brief lesson in various types of motorcycles, he explained that he was inspired after he rode one virtually while playing a round of the popular computer game Grand Theft Auto, which would imply that contrary to common belief computer games are not entirely a influence on youngsters, here is a teenager whose creativity has been triggered by one. He also gets inspiration from cartoons. 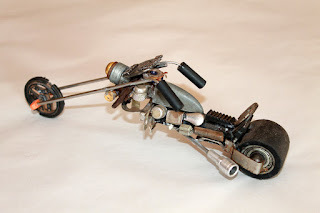 “For this bike, I went to an old radio and got the knobs which I later used as the wheels, I also used some stuff from an old fishing rod,” he explains saying that he is in his comfort zone when he has all these bits and pieces in front of him. Some of the pieces that he uses are in fact so miniscule one would think he uses a magnifying glass and can easily pass for a Swiss watch maker. 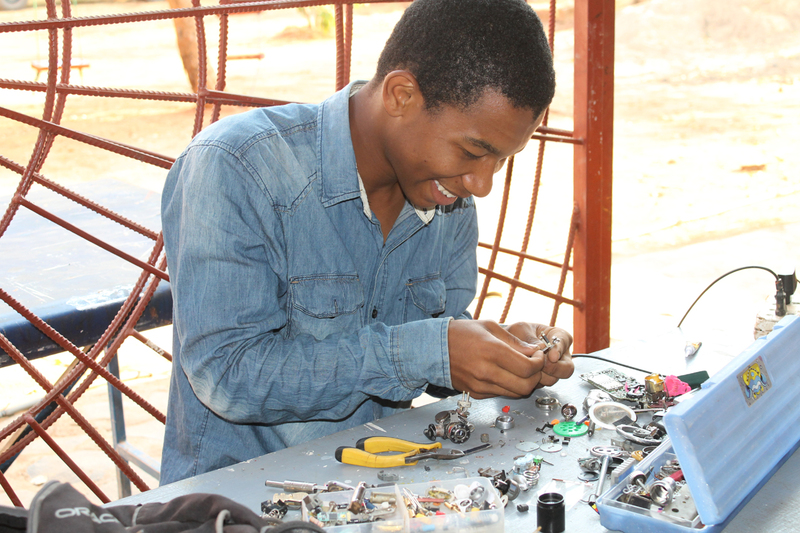 Phiri has several boxes filled with the discarded trinkets that he collects in his backpack. For him every day is an adventure because he never knows what next he is going to make. He does not draw sophisticated sketches or blueprints but creates his works adlib or ‘freestyle’ as it were, and the does all this in a house that does not have electricity, often working under candle light at night. Fortunately, a friend of his, Mr Kondwani Yombwe is the son of the renowned Livingstone art couple, Mr Lawrence Yombwe and wife Mrs Agnes Buya Yombwe whom after being introduced to the boy and being moved by his work offered him space in their Wayi Wayi Art Studio. Mr Phiri can be found at the studio taking advantage of the well-lit space when he wants to work late; the reason why the house he lives in does not have electricity is due to some recent renovations he and his mother made to it. He says he and his mother did not even hire a brick layer to build the extension to the main house in which they are living, they did it all by themselves. He says his mother, Junita Heppletchwaite – who is of Lozi and Dutch heritage – is the most innovative person he knows, and it has not been easy for her to raise him as a single mother. His father, Jay Adolph Phiri once a famous Zambian musician and member of The Rising Stars a popular boy-band that took the country by storm in the 1970’s performing both locally and internationally, died when he was only four years old. However, owing to young Mr Phiri’s photographic memory he still remembers and cherishes the moments he spent with his father for the first few years of his life. But it is to his mother that he looks up to due to her perseverance in raising him and his siblings, which was not always easy as they had to move from town to town, Chingola, Ndola and finally Livingstone and he has vowed to make her proud by becoming a success in life. His dream is to acquire a scholarship that would enable him to study Robotics or Industrial Design after he completes his secondary school. 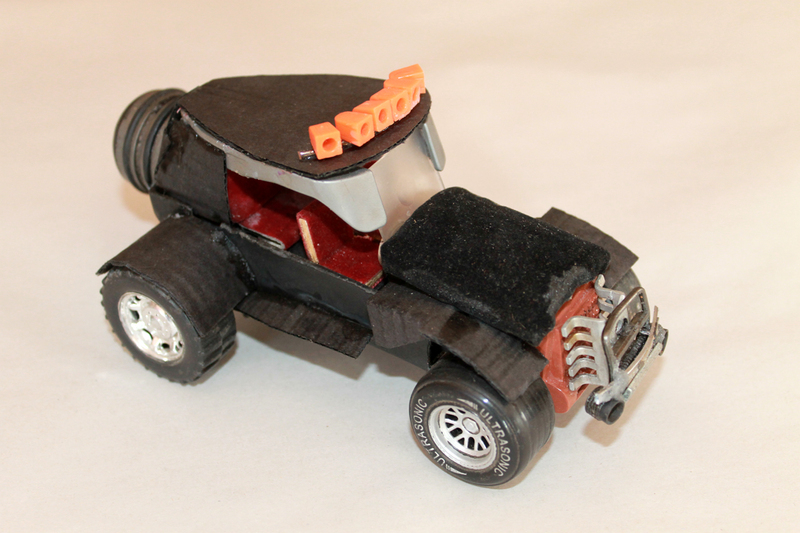 A degree in Industrial Design would enable him to use both applied art to design as well as invent anything from household products to new types of vehicles. But among Phiri’s top aspirations is being able to design artificial limbs by the use of Cybernetics to assist amputees and accident victims. As much as his prodigious creative talent, is coupled with the advantage of youthful enthusiasm, the devoted young Christian believes in God’s grace and in September this year, he attended a deliverance sermon at Divine Fire Cathedral in Livingstone. “I met Christ, I was one person who never wanted to hear anything about God, but now I am a changed person”, says Mr Phiri. 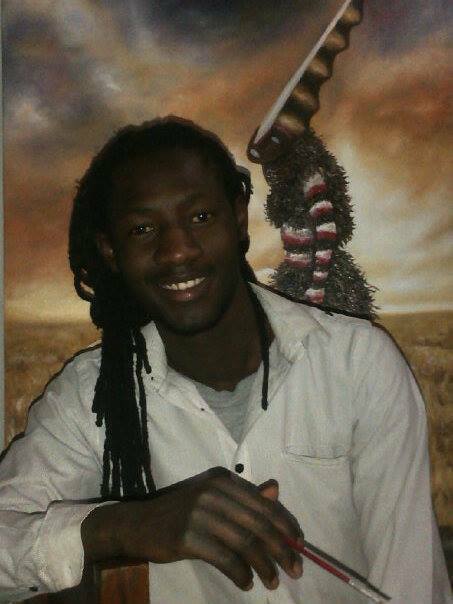 In 2014, through this writer, The Bulletin & Record, heralded Ignatius Sampa a 23 year old Lusaka-based painter as a creative prodigy, the next big thing on the Zambian art scene, and rightly so because the youngster created ripples when barely two years ago he adventurously introduced caricatured portrayals of the Makishi costumed figures from the Mukanda initiation masquerades of North Western Zambia. Of course it could not be foretold that through a late night hit and run road accident in Lusaka, the same year will in fact claim the life of this young man who enjoyed perfect physical health and a lively social life. But the word that has been doing the rounds on the art scene since the fateful November day of is that the Makishi were finally fed up of Sampa’s shenanigans.They were tired of disrespectfully being portrayed in renditions of Da Vinci’s Last Supper and Mona Lisa, riding Harley Davidson motorcycles,doing the Salsa or playing the violin and so by otherworldly means claimed the artist’s life by physically manifesting the death in a fatal accident. “Mudala mizimu za Makishi zina kwiya na ma paintingi” (big man, the spirits were not happy with the paintings) said a close friend and fellow artist who shied away from being mentioned but confirmed that he once warned his friend against going too far with the portrayals especially because he was not from the region and may have not have understood how respected the Makishi were. Sampa had made himself synonymous with these figures sacred to the Luvale, Chokwe, Luchazi, Lwena and Mbunda people so much that he was often called “Mufana wa Makishi”loosely translated as “Makishi boy”. Also known as the Akishi in Angola and the Democratic Republic of Congo they are believed to be spirits of the deceased. 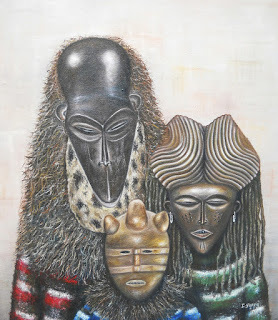 In the 1990 book Makishi, Mask Characters of Zambia by Manuel Jordan, John Picton from the University of London writes: “[…] they embody the spirits of important and memorable deceased individuals and as such they are treated with due reverence”. Nevertheless, about two years ago when the artist just burst on the scene confessed that he was approached by fellow artists from the North Western region who advised him to stop and warned him against the continuous adulteration of these sacred figures that are evoked by means of masks depending on which ritual or ceremony. The Makishi’s individual roles and hierarchy differ, some represent royalty, some are for protection, some are for fertility. For instance in the book “Ceremony!”, Tamara Guhrs writes: “Kayipu is the King of the Makishi, mask associated with the chief. If a chief’s son or nephew is being initiated, Kayipu must be made” and Chikishikishi is a likishi “with a pot of burning coals on his head. Disciplining function, supposed to eat up evil elements in society”. But Sampa represented them whichever way he wanted. His very last painting is unfinished needless to say, but it ironically depicts a Likishi that appears to be running off with a painting and an easel. Is the painting a manifestation of the Makishi snatching the art from the artist but doing so by taking his life? Was Sampa’s hand possessed into painting a physical manifestation by means of a metaphor? Who knows? But the chatter remains adamant the spirits did claim his life and as such, one may argue that no artist will be seen going down this experimental path any time soon. While the Makishi will remain a favourite subject among Zambian artists, there is doubt that anyone will attempt to depict them the way Sampa did. Whatever the case, his disturbing deathwill forever evoke deep reflection on the sheer futility of life, the loss of a young man with incredible promise who will remain one of the great young revolutionaries of the Zambian art scene. His professional art career only spanned 3 years including a long period in which he had disappeared from the scene altogether, only to return to his brushes early last year. In his last days he was working non-stop as if preparing for a solo exhibition. In his last interview when asked what he intended to do with all these paintings during an interview for the Bulletin & Record his response was: “Now I’m just painting because art is what I love doing. I’m not painting to sell at all, maybe later but not now, yes I will put a work in an exhibition now and then but I’m not really thirsty to sell. Sometimes people will offer me money for a work but I won’t sell it because I want to be looking at it myself”. 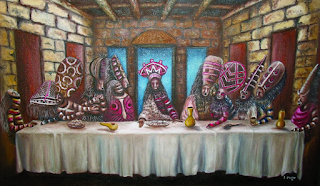 On his Makishi Last Supper these were his words: "All the last supper paintings I've seen have 'white' people in them, so I thought I should make one that is more African, in fact more Zambian, and for me there is nothing that represents Zambia more strongly than the Makishi”. 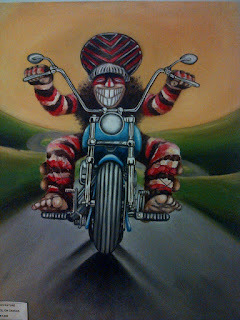 Among his very last works are Coat of Charms a play on the Zambian Coat of Arms which he explained was almost rejected from showing in the Zambia Jubilee exhibition because it was considered too controversial, the work nonetheless is a good example of his boldness and Adventure, a painting that depicts a likishi on a motorcycle cruising the open road embodies the artists free spirit.